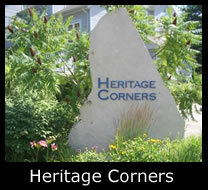 Heritage Corners, Blue Mountains is a development of 62 townhome condos located in a quiet family neighbourhood, within walking distance of South Base Lodge and Blue Mountain Village.heritage Corners offers great value and larger floor plans for seasonal or full time residents. The location is minutes to Monterra Golf course, private Blue Mountains golf and ski clubs, and biking & hiking trails. Amenities include a recreation centre with games room, two tennis courts, playground and an outdoor seasonal saltwater pool. Many units have good views of the mountain and all have private patios. Amenities: Recreation Centre with games room, seasonal saltwater swimming pool, tennis courts, playground, air conditioning, deck/patio, landscaping, snow removal and parking spaces..